Debra Dean went on a pseudo blind date, hoping to unravel a bizarre tale of love, lust, creativity and lifelong friendships. The acclaimed author and FIU creative writing professor knows that starting a book is like the beginning of a new relationship. There has to be something about the subject to draw her in and keep her interested. While writing Hidden Tapestry: Jan Yoors, His Two Wives, and the War That Made Them One, Dean was obsessed. The biography tells the story of Jan Yoors, one of the 20th century’s most important textile artists, and the polygamous family he formed with his wife, Annabert van Wettum, and her childhood friend Marianne Citroen. Yoors was born in Belgium and fought in the French Resistance during World War II. After the war, he married van Wettum and began an affair with Citroen. The three moved to New York City as Yoors pursued an art career. 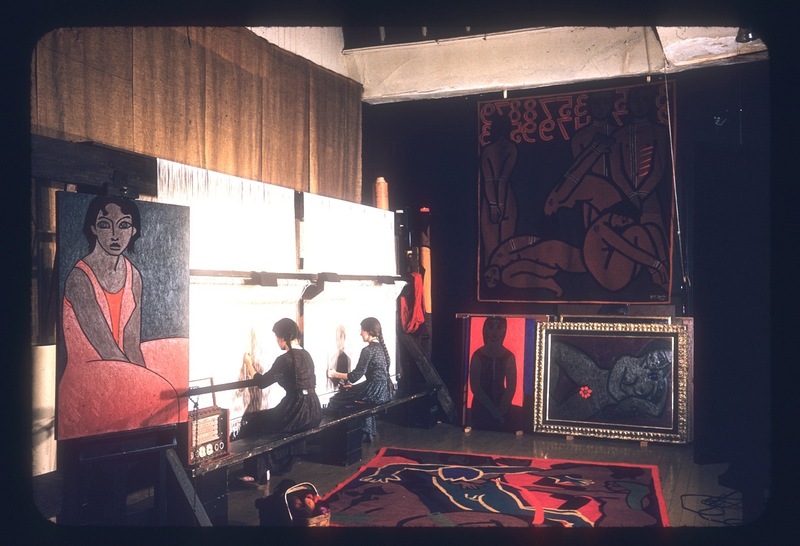 His photographs and tapestries were exhibited in prominent museums, galleries and public buildings in the 1950s, 60s and 70s. Annabert van Wettum and Marianne Citroen in the Yoors’ first creative studio in New York. Photo courtesy of Yoors Family Archive. Dean flew up from Miami to New York City to meet Citroen not long after van Wettum’s death in 2011. To her, it felt like a blind date. Citroen had to decide if she trusted Dean enough to tell their story. Dean had to decide if it was a story she wanted to tell. Dean’s fascination with Yoors, van Wettum and Citroen began on a whim, via an introduction by Books & Books owner Mitchell Kaplan. Yoors had written two memoirs before his death in 1977. His story was known. The story of his wives was the mystery. Although their relationship was unique and Yoors received help from his wives in making art, they had stayed behind the scenes. Hidden Tapestry is the first book to take van Wettum and Citroen center stage. Dean relied on Yoors’ memoirs to supply his insight. She also conducted more than 100 hours of interviews with Citroen — a combination of in-person and over Skype. Citroen entrusted Dean with her lifelong friend’s letters and diaries. Dean combed through 6,000 pages of letters and probably just as many diary entries that van Wettum had saved since her youth in Europe. They were all written in Dutch so Dean relied on Citroen for help. There was a lot of back-and-forth translating and clarifying for understanding. For Dean, a non-fiction book was an entirely new experience. She had authored short stories and fiction novels, including Confessions of a Falling Woman, The Mirrored World, and The Madonnas of Leningrad. She was used to conducting extensive research that allowed her to make up plot and characters as she wrote. But the interview process made writing Hidden Tapestry that much more difficult. Today, Dean has embarked on a book tour to promote Hidden Tapestry. She stays in touch with Citroen, someone she grew close to during the years she researched and wrote the book. She has developed an intimate connection to the story and its characters even though she knows there will come a day when their conversations will become fewer and their reasons to chat will fade. Dean is now facing the reality of moving on from a story that has been very much a part of her life for the past seven years. The first step in that process is simple, according to her.